Choose from our amazing collection of party equipment for weddings, birthdays, baby showers & more. Our certified event decorator is equipped with the ability to match any design for every celebration. Come discover our available party equipment rental at 6650 Flanders Drive, Suite I, San Diego CA 92121. Our top-rated San Diego Party Rentals & Decor furniture are ideal for weddings, baby showers, birthdays & other events. Our business is rated the #1 company for event and party rentals in San Diego, specializing in unbeatable equipment rental prices. We provide our customers with reliable, high-quality services for all of your special events. Our company focuses on weddings, public events, baby showers, quinceañeras, carnivals and more. Our Party Rentals in San Diego are second to none. San Diego Party Rentals & Decor has received over 100+ customer reviews regarding our outstanding rental services and our reliability. Wedding Rentals San Diego: Finding the perfect wedding decor takes a lot of time and effort, there are so many decisions, things to consider and prices to negotiate. Well with our affordable prices and our amazing collections of tables, chairs, canopies, farm tables, gazebo decor, wedding arches and more, our specialties can find the perfect match for your big day. Busy with planning the wedding and don’t have time to come to our showroom? We will come to your location or venue and provide you with a personalized (and super affordable) quote based on your ideas, your budget, and the space available. 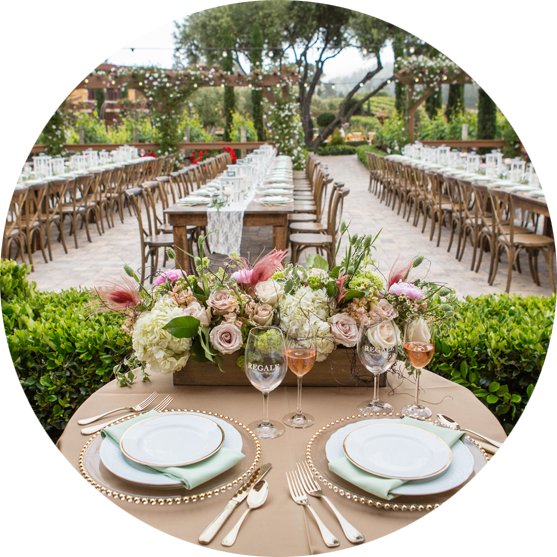 Wedding Party Rentals San Diego: Party Rentals & Decor is the leading provider of wedding furniture, decor and equipment to make your big day special. We offer an extensive product line of furniture pieces that will fit any occasion. Our wedding equipment rental services provide our clients with amazing support, prices and the guarantee that everything is fully insured. It is common knowledge that the right seating can either make or break an event. That is why we offer you a variety of seating options, all at affordable prices. With our wedding chairs and tables, you can go from low-cost and functional to luxurious and beautiful without skipping a beat. We give you the right combination of elegance, size, convenience, and comfort so your wedding day is picture perfect. Our comprehensive selection of tables are perfect to complete the look of your special occasion. We are equipped to accommodate all occasions and events of various sizes. Whatever is needed to make your event perfect, we promise to deliver. Party Rentals Online provides over 100 different party favor sets, all of high quality materials and at affordable cost for all types of events. 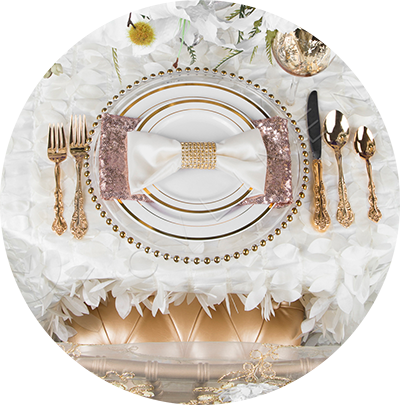 Individual items can be requested with the ability to configure your own set or purchase any of our professionally designed party, wedding, anniversary or baby shower kits, specifically designed to match your party or event. All of our party favors are inspected under Party Rentals Online’s own “triple-inspection” system to ensure that you receive your items precisely in the manner that you requested. If your favors require that special touch, such as gift wrapping, we will provide you a variety of designs for you to choose from. We offer all of our customers with the fastest and most affordable shipping costs. Choose from our regular mail, express services, or overnight delivery, all at extremely affordable prices. 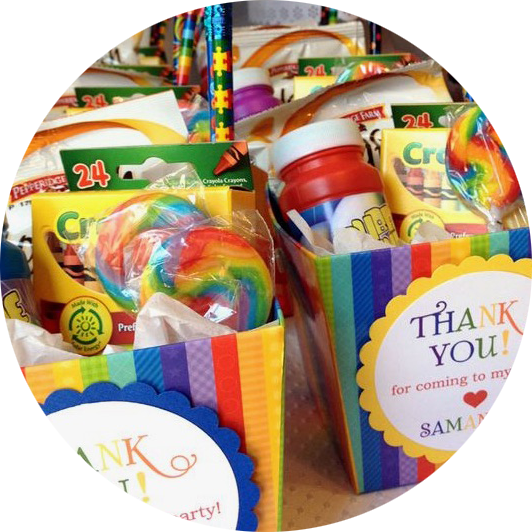 Plus, you can request to have your party favors arranged into sets. 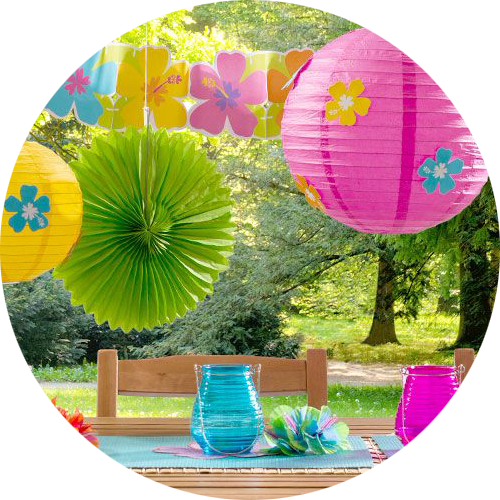 Party Rentals Online offers over 1,000 decor items and over 20 special occasions themed designs to choose from. We offer our customers exclusive, high quality and affordable party decorations for every event. Configure your own decor basket or choose from our professionally designed party decoration theme, custom tailored to your party or event easily by visiting our San Diego Showroom! With our unique collection of party decorations, you can rest assured that we will provide you with only exceptional quality items that will complement your party in a beautiful way. For us, parties are supposed to be magical, especially your little ones birthday parties, where the magic really does come to life. We pride ourselves in making every aspect of the event matter. When you purchase from Party Rentals Online you are backed by our award-winning customer support team that will answer any questions, guide you through the checkout process and to ensure a trouble-free buying experience. San Diego’s only event decoration showroom! We are all about helping you find the most impressive and jaw dropping decor for your party or event. Once you find them we will ensure that they come in exactly as you pictured them. Our collection of party decorations go through a three-step checkpoint system employed at Party Rentals Online to ensure that you only receive the items precisely in the way you expected them. Plus, if you don’t see the items you need, we will help you find it. Online, Email and Telephone Ordering Made Easy for your Party Equipment. 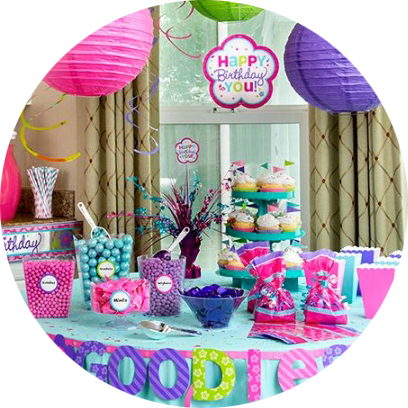 Party equipment ordering is made easy with our online, e-mail and telephone ordering. We provide amazing rental supplies for any party or occasion. At Party Rentals Online we have everything you need, whether it be for your kids superhero birthday party or for your husbands 50th, we have the equipment rentals you need. With over 500 unique, high quality party supply items in our inventory, we provide anything you need for your special event. Each of our party rentals come equipped with tableware, cutlery and party favor packages that can be ready made. We are the preferred party rental supplier in the San Diego area for our amazing and affordable variety of party decorations. From party favors like neon sunglasses, balloons, Joyin Toys, Sticky hands, goodie bags, and folding fans, to personalized invitations, banners, tableware, and paper products. We offer a same day shipping service for all orders placed before noon. Our guaranteed delivery service ensures that you receive your items on time and in perfect condition – just as you expected them. Did you find a lower price on a party rental store near you? 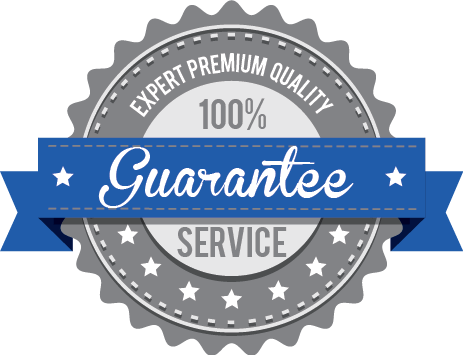 We will meet and beat any price that is lower than what we originally offered, guaranteeing that any of our items are the most affordable price around. We guarantee that your rental experience with us will be like no other. Each customer will receive only the top of the line party equipment received exactly as ordered. Party Rentals & Decor is truly the only party equipment rental provider that was built with the customer in mind. We make sure to deliver party equipment of the highest quality without compromise. We socur through thousands of websites, keep a stocked inventory, and analyze customer reviews, to build a premium-grade party equipment rental platform. At Party Rentals & Decor we strive to provide you with premium-grade party equipment rentals that you can depend on. We know that there are no second chances when it comes to your special party or event, one broken item and your guests will be disappointed. Everything must be perfect and in working condition to make your event the best possible. When you rent from us, you can rely on our reliability and trust – we understand how important your party is, and we take the extra steps to ensure your event rentals are hassle-free. We’ve analyzed over 500 customer reviews since 2007 and we continue to refine our process and equipment to match what you want. Sometimes we even evolve our already top quality equipment to fulfill our customers needs. No other provider can match our award-winning customer support and care, nor can they match our superior custom made party equipment that is second to none. Party Rentals Online was founded with the intention to create a simple to use web platform that allowed anyone to easily rent party equipment, hassle free. In order to achieve this task, we had to analyze over 1,860 sites that offered similar services, but we didn’t stop there. With the amount of customers complaining about the lack of premium grade party rental equipment in their area, and how customer service was severely lacking, we formulated a plan to improve upon these and other party rental deficiencies. Not only are we working towards enhancing our business, but we want to make our customers have a hassle free experience renting from us. Our main goal is to ensure that you receive not only premium grade party equipment that conforms to the highest of quality standards, but that you receive award-winning customer services you won’t find elsewhere. Please note that some cities in the San Diego county have special park permit regulations. In order to maintain these requirements, we invite you to visit the San Diego County park permit information website to learn more about which permit to use for your particular needs. Party Rentals Online is a fully insured party rental provider as required by the city of San Diego and its recreational parks. Please contact us for additional information or to obtain a copy of our insurance policy once your online request has been submitted and approved.